Man At The Window Looking Documents That Iterates Over In His Hands. Man at the window looking documents that iterates over in his hands. Behind the large transparent window winter cityscape with low houses on a clear sunny day. Male wearing a fiber shirt, which rolled up the sleeves to the elbows. A stack of sheets of professional studies and shifts one after another. Architects studying plan drawing made on paper. 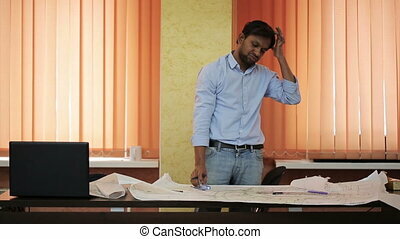 He ponders how to implement the project a reality. Young man standing at the window with the X-ray image in his hands. He looks gravely at the picture, which depicts a human spine in different forms. Male has a small mustache on his face, has a short stylish haircut on dark hair and wearing a plaid shirt, which rastegnut top button. In the background, through the window penetrates the urban landscape, illuminated by daylight. Medical University student preparing for the exam. The man leans on the crossbar and holds the documents in their hands. He studies paper in a large hall, furnished in shades of coral. A young boy wearing a plaid shirt, blue pants and brown shoes. The floor and ceiling are made of glossy tiles. At the edge of the second floor, metal fences installed. Large windows closed shutters gets bright light that illuminates the spacious room. Nearby is a large green plant in a pot. 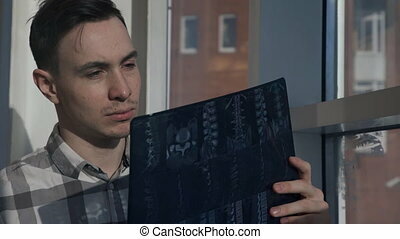 In the policlinic young man looking at an x-ray image of a spine. Male with small mustache, dressed in a white plaid shirt, which is rolled up his sleeves, standing in a corridor spacious bright room and still holding a picture. He peers into black image. In the foreground Green palm in the pot. In the background the empty transitions with fences on two floors. The patient underwent a medical examination. 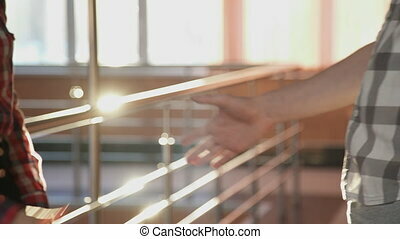 The man and woman friendly shake hands in the hallway with sunlight. The guy in plaid gray shirt stretches out his hand for what to take a brush woman in a red blouse. On the fingers Lady suffered manicures and wearing a gold ring. Two business partner meet at a business meeting to discuss financial issues. They stand on the trading floor near a metal fence, which reflects the flash of bright light. Woman is with a man who holds in hands a sheet with the schedule. In the lobby, slow steps people move forward and talk about the documents. They discuss the topic during a break between lectures. Beautiful lady wearing a red blouse and black skirt, and tall guy in a gray shirt and dark trousers cage. Interior of the corridor is in the orange colors. At the edge of the metal fence installed. The spacious room are pots of flowers. Students of the Faculty of Economics study performance indicators. 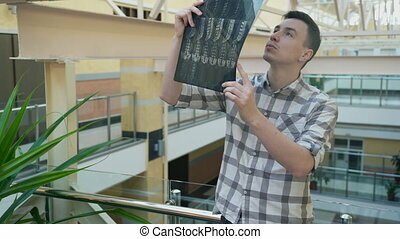 Man with mustache in the window sees the X-ray picture of the spine. Young male stares at the photo after a medical examination. Through the glass it enters the bright sunlight and illuminates the model, who is dressed in a white shirt with gray stripes. After an injury resulting guy undergoing treatment for bone health. A medical student at the University of teaching the subject for the exam your teacher. 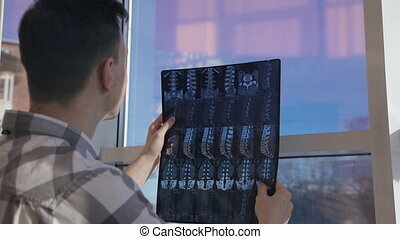 The man looking X-ray picture of a spine image to the window. Through the glass penetrates the bright light of day, so the the negative is clearly visible. 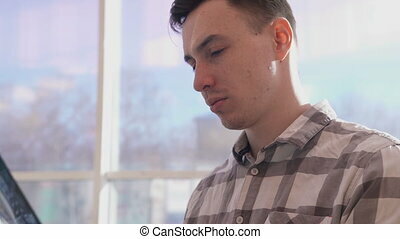 The man with short hair on dark hair and a close look at the photo to study the details. For transparent coating cityscape. The patient received the results of a medical examination after the injury. A student studies medicine to treat diseases. Man in plaid shirt palm leafs smartphone, which closes the hand. The human being with his hands grabs the phone. Cotton clothing is short sleeves, because the action takes place in the warmer months. 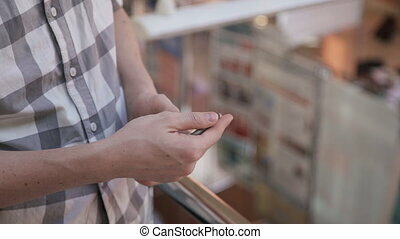 Male standing on the highest floor of the mall, and looks at new messages that come to your device. 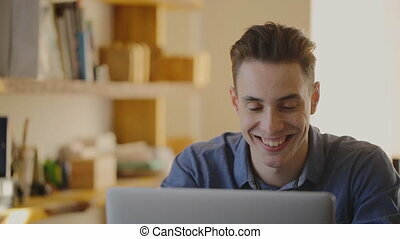 Person hides what he is looking for on the Internet through Wi fi. The spacious room is well lit lamps. Man in suit jacket give through chain, documents woman and other people sitting at same table. Division chief summoned his subordinates for a meeting. He asked blonde woman to pass rest of paper documents which he had prepared for them. Work plan for next quarter, it indicates problem individually for each employee. They sit at a rectangular table in office with designer things. 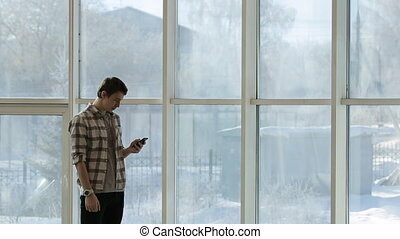 A young man in a plaid shirt and a clock on hand, looking at smartphone screen, standing beside a panoramic window with a winter landscape. He is dressed in a light beige plaid shirt with sleeves rolled up to elbows, grey t-shirt and a watch with a white strap. He stands on background of glass windows on entire height of walls of house. In one hand holds a smartphone and second fingers flips through pages. Outside window is visible metal forged fence standing around perimeter of a private house. 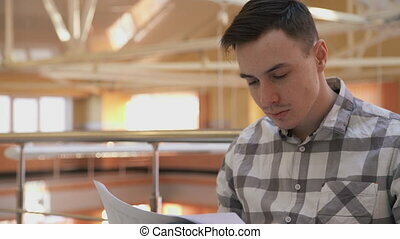 Young man in a plaid shirt conveys the woman on paper contract. Two people with dark hair sitting side by side and talk. Uncertain male holding a document in English, which gives a beautiful female wearing a red outfit for whatever that she studied and gave his answer. Pleasant companion sitting at the metal fence in front of large windows with vertical jalousie, which are easily swayed by the wind. 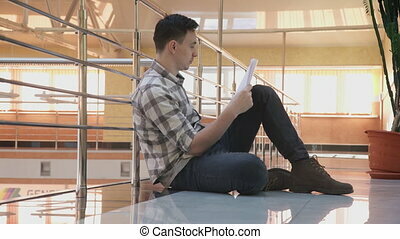 Young man sits and looks at blueprints in corridor of building. 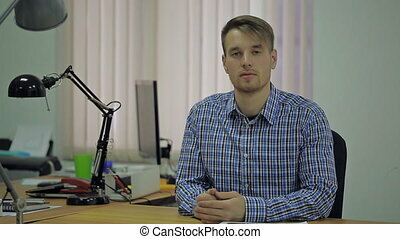 Handsome, brunet smart male, professional specialist, in casual clothes, white checkered shirt with long sleeves and stubble, holds in hands schemes of architect project and carefully examines papers, finding ideas for business, scratching back of head, with straight face. On background unfocused hallway of office building with several floors, railings and columns. Construction and architecture concept. Man in gray business suit writes on glass surface of window by black marker. He is busy with conversation on cell phone, on other hand he is concentrated on notes to give right information to his coworkers. People attentively watch his motions trying to understand message that he wants to address to them. Blonde man in white shirt with slightly disheveled hair comes to him and shows picture from smartphone to help his colleague create proper drawing. 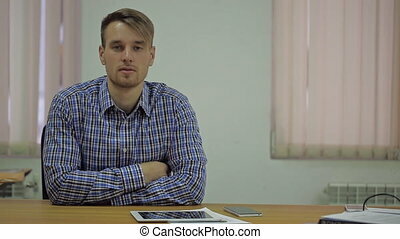 Young muscular man with a beard and a blue shirt sits at a table in the office full face. He is pretty. He has short haircut. He sits up straight and stares calmly without a smile. He sits in the closed position, it is clear that his strong hands are pumped up. He is a young professional or employee, but we do not know his specialty. On the table some papers and documents, a tablet. A window behind him is closed with blinds. Indian architect draws a blueprint leaning over the table. Designer accurately adds new elements to the plan. He often retreats from the table and looking down at their work. He paints almost everything using hand, only occasionally takes ruler. Whisk away remnants of a pencil from the paper hand. On a long table fit his big project roll up a couple of sketches and notebook in which he sometimes look. He works in a bright room at the windows of which closed blinds. 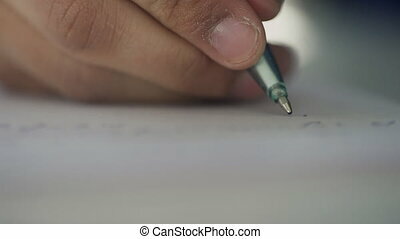 Hand of man writes on white paper with pen indoors. Head of large law firm signs accounting documents sitting at desk in comfortable office. Slowly and accurately, without undue haste he writing in large letters on the sheets of important documents that the secretary had drawn up and brought to his parlour. Boss after thorough check puts personal signature so that package of papers tomorrow morning was sent to partners of company.